Knights And Armor is dedicated to the history of the medieval knight (ca. 800-1500 C.E.). Here you will find information and links on the life of the medieval knight. Begin with the history of knighthood (ca. 800 C.E.) 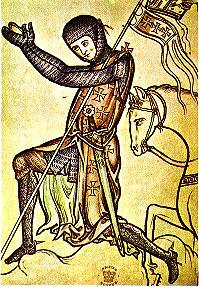 and trace the medieval knight’s role as a military, social, and political factor in medieval society. You will also learn about the evolution of the medieval knight’s armor and weapons as he tried to keep pace with the medieval arms race. Also discover the science of heraldry–the method of identification rooted in the Middle Ages. Also find out about the codes of chivalry that medieval knights were supposed to obey, as well as the ideals of the crusades. Enjoy your travel back to the Middle Ages as you explore the world of the medieval knight.